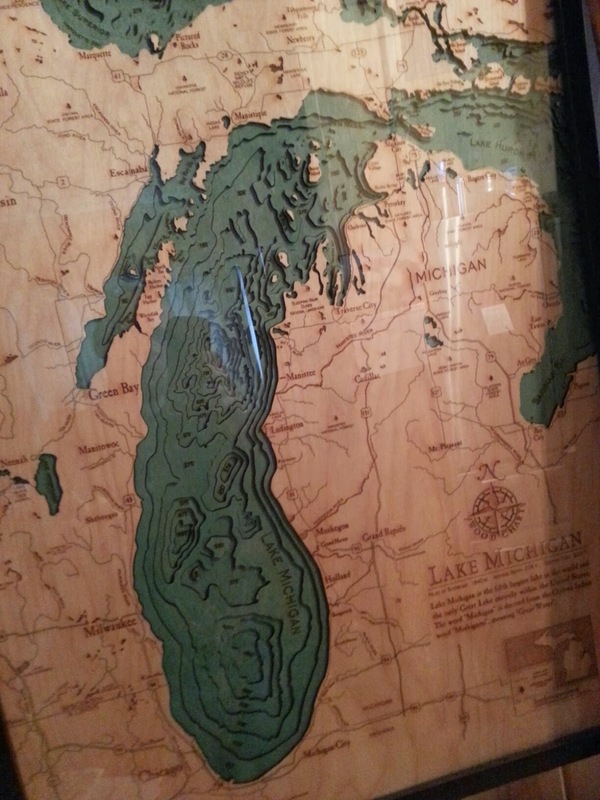 Dad's wooden bathymetry map of Lake Michigan. He wonders what they would look like with a continuous color palate. But he's often told me that he wished each depth layer would have a deeper-looking color, and I agreed. Based on how they are made, that would be really difficult (expensive) so I told him I'd make fake digital ones and show him what it might look like if depth were tied to a range of colors. Then, of course, I got carried away. The results look less like the laser cnc map, above, and more like they were milled out of a thick block of wood. Which I like even better, actually. Because my maps are virtual, I can easily swap out the wood species for a totally different look. And if you admire woodgrain the way I do, then you might enjoy the variability of the aesthetic. Different types of wood have different lightness and really varying contrast, both having their own trade-offs. What are the Real Ones Like? 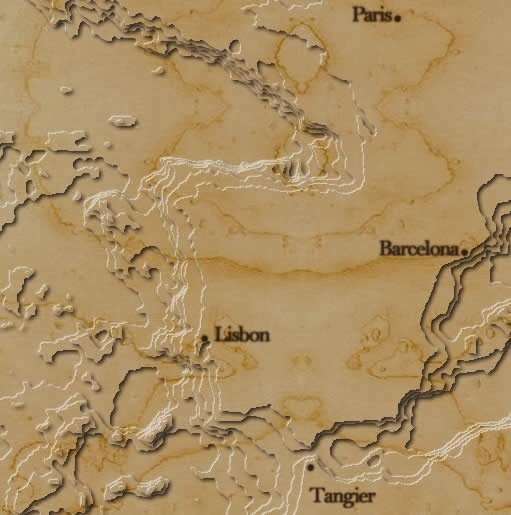 Some of the hallmarks of these maps are their generalized contours (so cutting them out of wood is feasible), slightly imprecise cartography (it's a map cut out of wood, give them a break), and wood-burned labels. The real maps start out as a thin sheet of wood, laser-cut along bathymetric lines of equal depth. Areas of ocean get stained aquamarine and land stays bare wood. Cartographic labeling and titles get burned on with a hot letter press, like a brand. Then they are pushed into a backing form that offsets their heights according to the depth layers. Drop that into a frame and paper up the back so as not to reveal the magic. Ship to nautically-inclined retail locations. -Data. 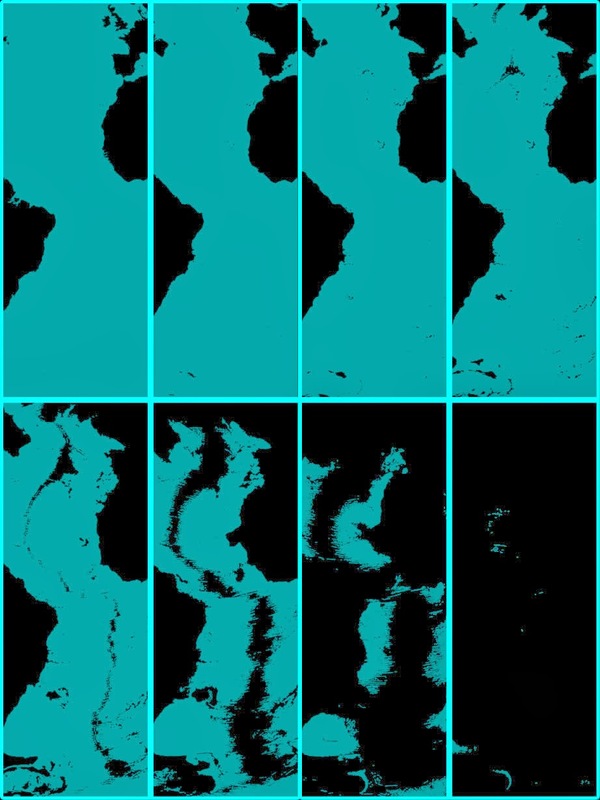 I found the bathymetric source data at Natural Earth and projected it to a centered Winkel Tripel projection. 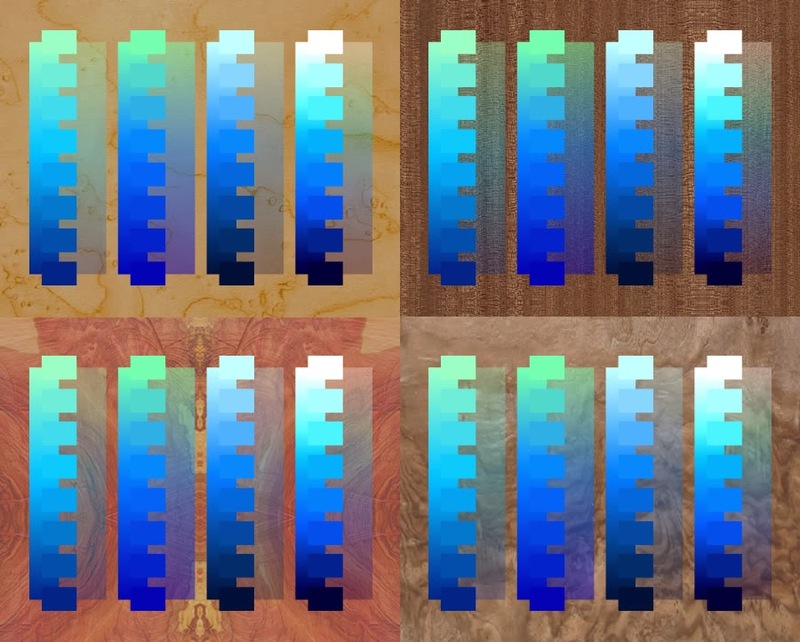 I exported each depth sequence as an individual image layer with a transparent background. Because this data has much more precision that is realistic from a wood-cut, I included a rather thick outline stroke to give a smoothing effect to the edges. 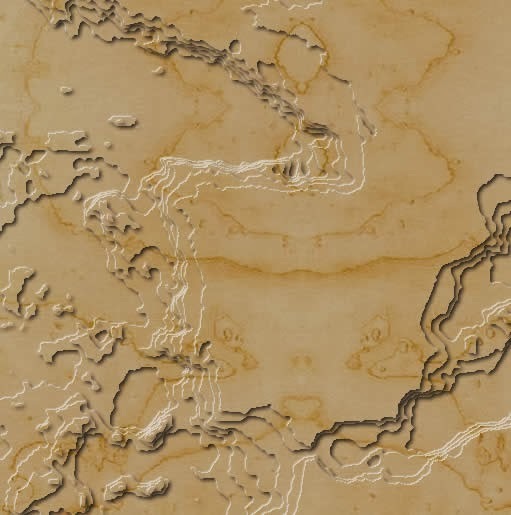 I'm not too concerned over the cartographic oddities this outline creates (the island in coastal Brazil, for example) since the real woodcut maps are inherently generalized and I don't mind a bit of kitch. But the source data is stellar, to be sure. -Clipping. I used each of the depth layers as the clipping (or "masking") source for my stock woodgrain imagery, individually, in an image editing program. I used Fireworks, but you could do it in Illustrator or Gimp, or Photoshop, whatevs. I offset the grain pattern fill slightly for each layer to replicate the small depth change in the "block" of wood. Then I added a beveling filter (AKA an inset shadow of white in the top-left and an inset shadow of black to the bottom-right) to give the effect of protruding elevation with an imaginary light-source in the upper left (which is right where a light-source should be, for some reason). -Text. I used two types of text in the map. The first is the simple branded wood-burn text for cartographic labels. To do that I used black text with a dark brown glow filter to replicate the creeping of the scorched wood. For title text I replicate a wood inlay. I do a black text with an inset bevel and slight Gaussian blur (to replicate the carved out wood channels) and on top of that I duplicate the text and give it a brighter wood species pattern fill with a bevel filter (to replicate the cut-out letters I crammed in to the cut channels). Do yourself a favor and watch this demonstration of actual inlay lettering to really appreciate the ease of changing digital fonts, or if you just like typography in general. -Color. Picking the right color palate was more involved than I thought (but, considering this was the whole reason for doing this, I didn't mind). The goal is to make it look like the wood has been slightly stained at each depth, so I used a 20% color fill filter to each wood layer along the 8 color stops I ended up with. Because of how much the underlying wood coloration affected the tinting, I worked through several iterations until I got something that didn't look like it went from green to purple. It was a good reminder of the impact of underlying colors and textures for regular mapping. I think that's just about it. Thanks for having a look! Brilliant post. Thanks for sharing! This is absolutely awesome! Brilliant work.